11-MINUTE READ · By Supermetrics. We’re happy to announce a major update to our Google Search Console integration for both Google Sheets and Google Data Studio. 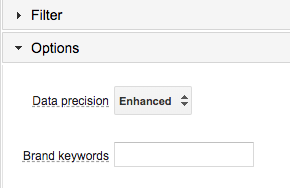 We are adding several new fields which make it much easier to analyze Search Console data. Big thanks to Joona Tuunanen and Jyri Vuorinen from the OIKIO agency, who provided the inspiration for doing this update. When analysing your search traffic, it usually makes sense to look at branded and non-branded search queries separately. With our new branded vs. non-branded search queries dimension, you can easily distinguish these two groups of queries from each other. In our Google Sheets add-on, you can specify the brand terms for your company in the Options tab. In Google Data Studio, you can do that in the config screen for the data source. If you don’t specify any brand terms, we use your domain name as the brand term (eg. when fetching Search Console data for “https://supermetrics.com”, we assume “supermetrics” is the brand). Our system will automatically link close variants of your brand terms with your brand, eg. “supermetrix” will be considered a brand term for Supermetrics. CTR curves that plot click-through rates by search engine result position are tremendously helpful for many things. For instance, you can compare your CTRs to industry averages to see how your SERP listings are performing, measure the impact of changes you make to title tags, meta descriptions and rich results, and estimate what effect a change in rank could have in terms of clicks. 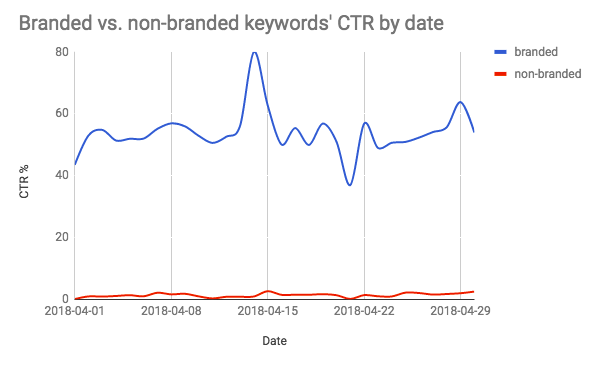 Previously, creating these graphs required a lot of spreadsheet data processing, but now you can get them very easily by using our two new dimensions, “SERP position (rounded avg. )” and “SERP position (rounded avg., paged)”. The former will output each position separately, while the latter will output positions 1 to 10 separately and further positions in groups of ten. Google Search Console makes it simple to analyze performance by landing page, but if you want to see the performance of a group of pages, for example everything under “/blog/”, you will need to do a lot of work in a spreadsheet to categorize the data. Even when analyzing a single page, you may see that Search Console lists it multiple times with different query parameters or anchors (eg. “/product” and “/product?sku=858”), so you need to combine them in a spreadsheet to get the overall stats for the page. You can extract different parts of the URL to group data and analyze it in a number of different scenarios. Below we will cover some of them. For example, the “hostname” dimension could help you easily separate the regional versions of your site – you can compare your blog traffic for a specific article in two different countries. Directory levels allow you to easily group different pages together: for instance, you can pull data for posts on a particular topic (“seo” in the example above). Query parameters help you drill down into the page URL even further. E.g. you can easily extract and group pages from different properties, traffic to which was brought by affiliates based on the affiliate parameter in the URL. The new update allows to go even more granular: it can pull anchor data, a specific section of the page traffic was brought to. We’ve added a new “# of words in search query” dimension. This makes it easy to identify long-tail search queries with untapped potential, as these usually have several words. Short-tail or generic keywords used in search typically contain 1 – 3 words and long tail terms contain 4 or more. 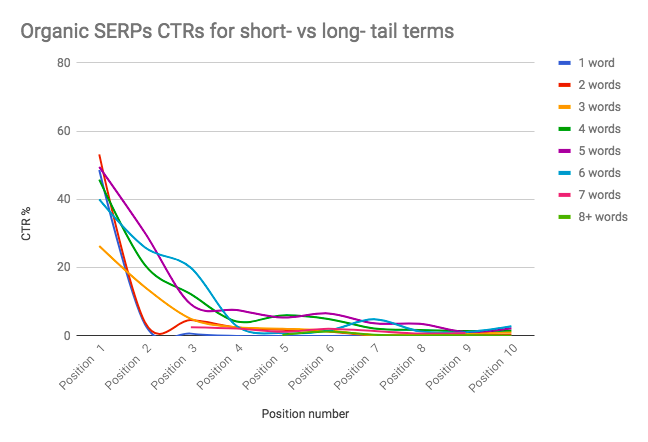 You can build a chart which shows the CTR of a specific position for keywords of the different length to identify your visitors’ search behavior. Do they use more specific phrases to find you or is it just one keyword? 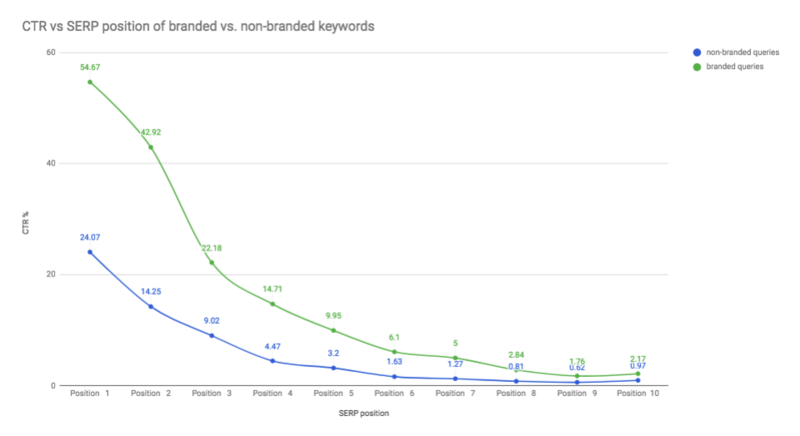 What is the SERP position of your long-term keywords? For highly-trafficked sites, getting fully accurate data may require the Supermetrics system to make a large number of Search Console API requests. In many cases, to ensure accuracy, we need to split the date range you are fetching into many smaller pieces and then stitch those results together in our system. The drawback of this approach is that pulling data might take some time. Normal: we don’t do anything special to improve precision, we make a single request to the Search Console API to fetch your full date range. This is fast but the results may not include data for all long-tail search queries. The last two options may be very slow to run, but should result in more accurate data, especially for highly-trafficked sites. Due to the load they place on our system, these are only available on our enterprise packages; if you are interested, please contact sales@supermetrics.com. Google is working on allowing 3rd party tools like Supermetrics to fetch more than 90 days of Search Console data. This will hopefully become available during the next couple of months. Meanwhile, you can use our “Combine new results with old” option to gather longer time series of data.